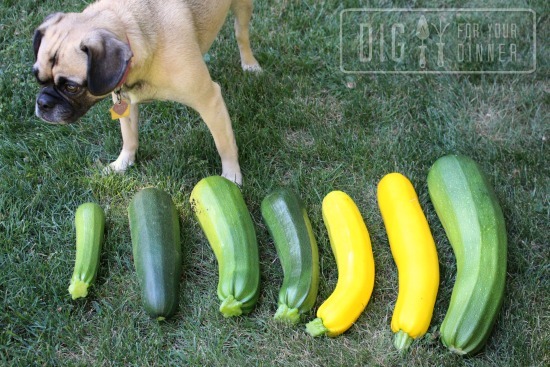 The puggle princess and I went out to the garden to grab a zucchini for a stir fry last night and I was shocked to find a bunch of zucchini’s waiting for us. I harvested 4 zukes right before we left just 5 days earlier… but you know how that goes. Zucchinis have a mind of their own and will grow like mad if left unattended. 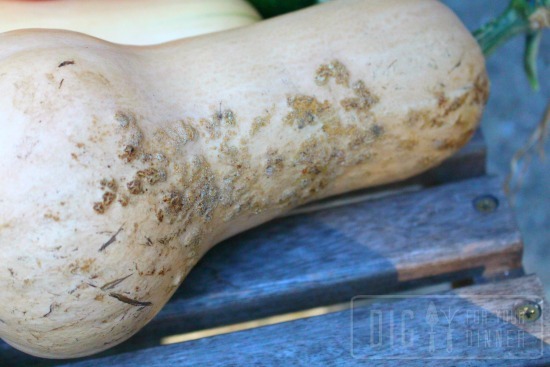 A little squash scab doesn’t bother me. How is YOUR garden coming along? What are you picking these days? « Ever Heard of Transplant Shock? Here in Maryland I can’t keep up with my tomatoes or cucumbers. The green bean bushes are putting up their second round of flowers. Unfortunately for the 2nd year in a row the zucchini is having a lackluster season. 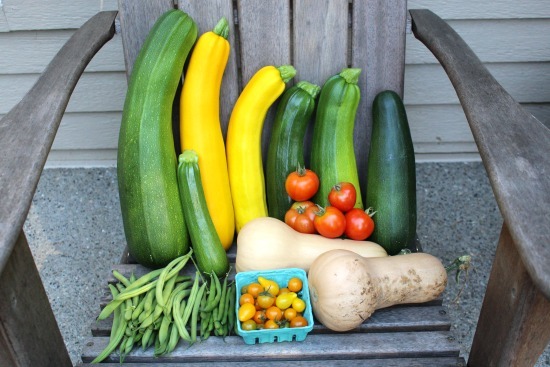 I planted all of my winter squash late, so I am hoping to still get good harvests from that. Great harvest, Mavis! I really like seeing your “brag photos” of all of your veg! 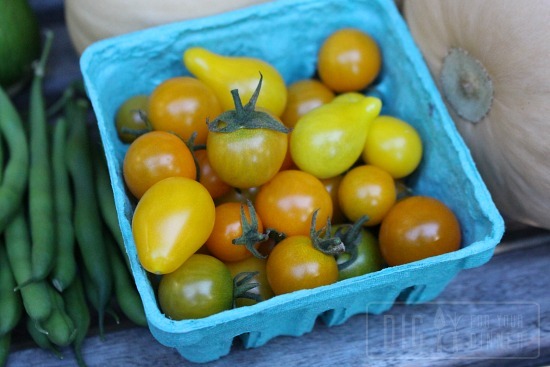 I have been harvesting onions, purple beans, purple carrots (they are a super vibrant orange on the inside), and Scallopini squash (aka Pattypan) which are so cheerful and remind me of sunshine. Of course beets, basil, turnips, rosemary and zucchini are being harvested as well 🙂 I’ve been doing my best to harvest the summer squashes when they’re small and tender so we can eat them raw as snacks. I grew kale and lettuce as well but I’ve been mostly feeding it to the rabbit and turkeys as I’m not a big salad person The tomatoes are taking forever to ripen but one day we’ll have some to eat! Potatoes and winter squash are growing and maybe a pumpkin or two will be big enough before it frosts soon. Gardening has been so much fun (but hard work!!) this year as we broke ground in the spring. Have an awesome day! We have been bummed to find that we have squash bugs in all of our plans. Not going to be a very good year for pumpkins or the squashes or zucchinis. Will have to do better next year! Our garden has had a rough year due (I think) to a very cold, wet start to the spring that seems to have stunted many of the plants–especially the peppers. Squash bugs and borers also took out our butternut and pie pumpkins, but our Seminole pumpkin is still alive for now. I’m hoping it can just make it another month or so to harvest as it’s supposed to be bug and disease resistant. This will be our first year with a fall garden, so I hope that makes up for the disappointing spring and summer. We were away last week so its been kind of crazy. I canned 14 quarts and 3 pints of sauce and still have 100 more tomatoes that were picked. Making bruschetta for dinner with some of those tonight. Made 4 quarts of dill pickles with our cukes and dill. Yummy. Picking foot long Italian string beans, bush beans, 3 types of lettuce, carrots,scallions, jalapeños, zucchini and lots of herbs. Trying to preserve as much as we can for the winter. Lots of work but so worth it.